A fine art print by Peter Biegel. 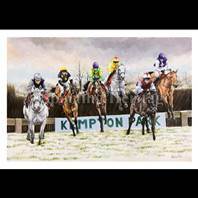 Image size 18'' x 24'' (46 x 60 cms). 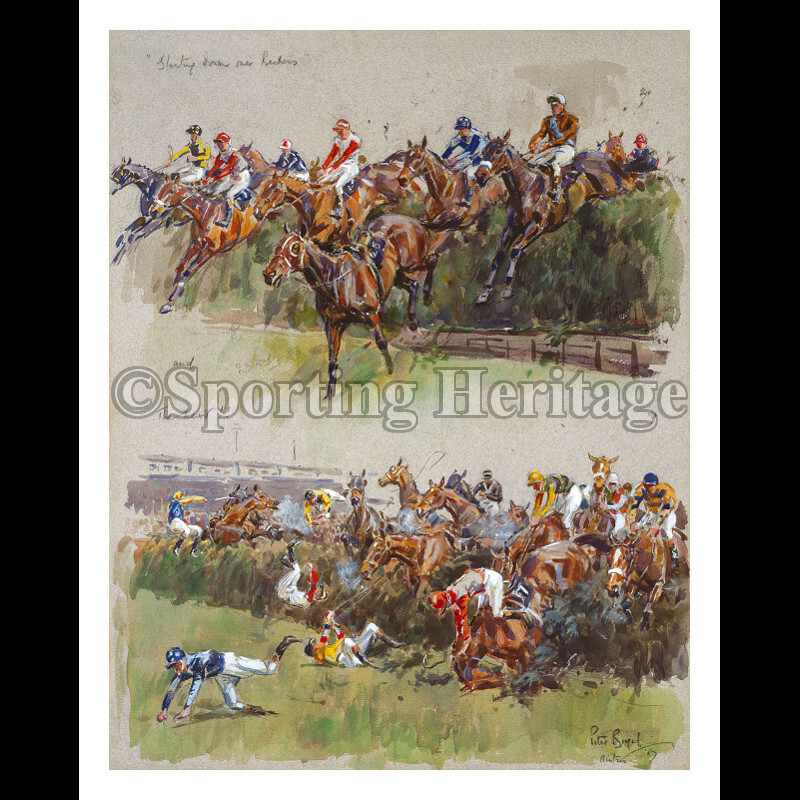 This picture depicts the famous incident in the 1967 Grand National when many of the horses fell at the same fence and a 100-1 outsider, Foinavon, managed to cross the fence safely and went on to win The Grand National almost unchallenged. The fence is now called the Foinavon Fence and the result of this race is the horse had been notoriously lazy during his career and had, indeed, been sold by Anne, Duchess of Westminster, who, of course, owned the legendary racehorse, Arkle. Foinavon had been compared to a plodding carthorse before but he managed to prove all of his doubters wrong on that particular day. Even his owner was not present to watch the race, also having dim expectations of the result. John Buckingham, the jockey, stepped in at the last moment as the previous jockey was unable to make the allocated minimum weight of 10 stone. The famous fence is Number 7 on the first circuit and Number 23 on the second circuit, which is where this memorable and historic melee took place. Interesting, the fence itself is one of the lowest jumps on the course. Red Rum "The Spirit of Aintree"